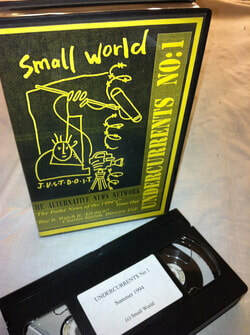 The first film to be released as Undercurrents was launched on April 1st 1994. You've got to be choking was about the M11 link road protest. This was a major anti-road protest in Leytonstone, London in the early to mid-1990s opposing the construction of the "A12 Hackney to M11 link road", also known as the M11 Link Road. Included was 300 people occupying the roofs of houses to stop their demolition to create a new road. Our film won the Okomedia award in Germany and it also launched our Undercurrents Alternative News on VHS videos. In 1994 internet video streaming didn't exist so DIY distribution was our method and VHS was our medium. We posted out thousands of videos to subscribers. Undercurrents Alternative News issue 1 included the 40minute documentary You've got to be choking and it also included our video reports about the Criminal Justice Bill 1994 which both curtailed a growing counter culture and invigorated it by bringing a diverse range of groups together. It was probably the first ever video report on the draconian bill as television had ignored it.